We are proud to present our newsletter! In this newsletter we will keep you updated about our newest products and latest projects. 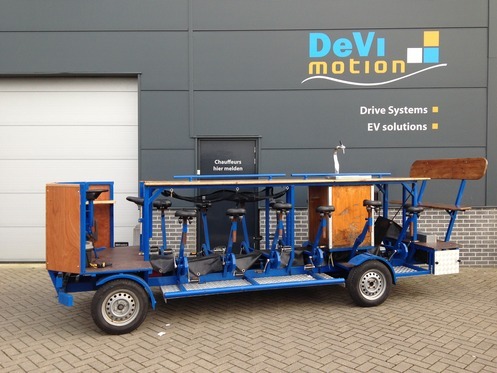 On behalf of a new client, who is specialized in organizing trips, tours and activities, we recently provided a beer bike with a built-in pedal assistance. Some of their clients said cycling on the beer bike could be a little tough. To convert the beer bike we used two Magic Pie Hub Motors and a 48V30Ah battery. The beer bike is also provided with a throttle, so returning the beer bike can be done electric. 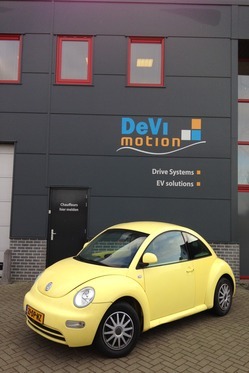 DeVi-Comfort is specialized in motion systems for (electric) vehicles. This is just another example! Using the beer bike is much easier now and offers more comfort for less effort. Visit http://www.rondjeregio.nl for more information. On behalf of Quattrocycle, we developed a four seater Quattrocycle on which cycling is facilitated through a built-in pedal assistance. To convert the Quattrocycle we used a 48V10Ah battery. 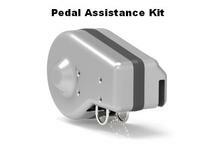 The pedal assist is based on strength measurement of the chain. This way you will have direct help of the motor. The motor input is only activated while pedaling. Using the Quattrocycle is much easier now and offers more comfort for less effort. Visit http://www.quattrocycle.nl for more information. 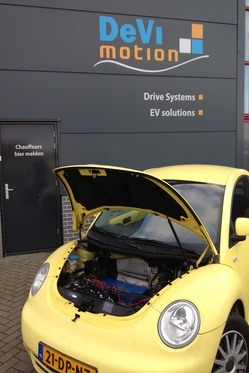 Our Full Electric Beetle is finished, and we reached some promising results. We have already reached a top speed of 90Km/h and we also managed to reorganize all standard electrics on board, so you hardly notice you are driving a full electric vehicle. Still to do: getting the car officially road legal. Flexicontrol is a Dutch company that produces electronic products which improve the habitat and workplace of people. Flexicontrol delivers ready-to-use, building-related, electronic products, concerning intelligent and integral solutions in the field of domotics and implementations for energy conservations that contribute to a more comfortable, sustainable, and safer use of the accommodation or workplace. DeVi-Comfort designs and produces the casing of some of these products, such as Wendy and the FCP20. For this we fabricate a prototype with our 3D-printer, in close consultation with Flexicontrol. After approval, the end product is manufactured by our Chinese business-partner. Visit http://www.flexicontrol.nl for more information. Mobile Viewpoint just released their newest product: WMT LTE++. WMT LTE++ is the first model of the new generation WMT models that fit both at the back of a camera or in a small backpack. The WMT LTE++ utilizes the growing availability of LTE/4G and the world wide availability of 3G networks. The WMT LTE++ utilizes 8 x 3G/4G modems and therefore offers both in 4G and 3G coverage areas high bandwidth HD video transmission. DeVi-Comfort is proud to be involved in helping Mobile Viewpoint develop the WMT LTE++. DeVi-Comfort designed and manufactures this newest product for Mobile Viewpoint. Visit http://www.mobileviewpoint.com for more information. DeVi-Comfort was recently tested on its accessibility by KPN on three different characteristics: functional accessibility (do we answer the phone fast enough? ), email accessibility (do we answer emails fast enough?) and clear contactdetails. Our score was 100%, the norm is 90% and the results in our industry were 76%. Obtaining feedback from our customers is vital for our company. This way we can keep improving our products, services and customer support. Therefore we would highly appreciate your taking the time to complete the attached survey. It should take about five minutes of your time. "Thinking in Solutions!" "Thinking in Solutions!" "Thinking in Solutions!"